Auburn School excelled at the ABC's during the 2010-11 school year - Algebra I, Beta and Basketball, and Community Service. It was a busy and productive year for students at Auburn School. Ten of the school’s 8th graders recently completed an online Algebra I course through the e4tn program, which means they will already have a credit when they enter high school in August. This work had to be completed in addition to their regular 8th grade Math coursework and took a lot of hard work and dedication working after school and on the weekends. After the coursework was finished, the students took an End of Course Exam, just like the ones administered to high school students. All ten of the students finished the course with an A average! We are so proud of these students! Marshall “the MarshMan” McReynolds will compete for national office this summer at the National Beta Convention in Nashville, Tennessee. He is currently Tennessee’s State Reporter. He won this office in November at the State Beta Convention, while his campaign skit won 3rd place. Throughout our history, we have had three state officers: Lance McAllister, Kayla McReynolds and Marshall McReynolds. We have won the State Songfest Competition, and have also placed in both Living Literature and campaign skits. We have also had a national officer, Kayla McReynolds, and we hope to add her brother, Marshall, to that list. These are great accomplishments for any school, but especially for a small rural school like ours. Dr. Darryl Deason has been an invaluable contributor to our success, as well as our dedicated sponsors, Dianne McAllister and DeAnna Reed. Our Jr. 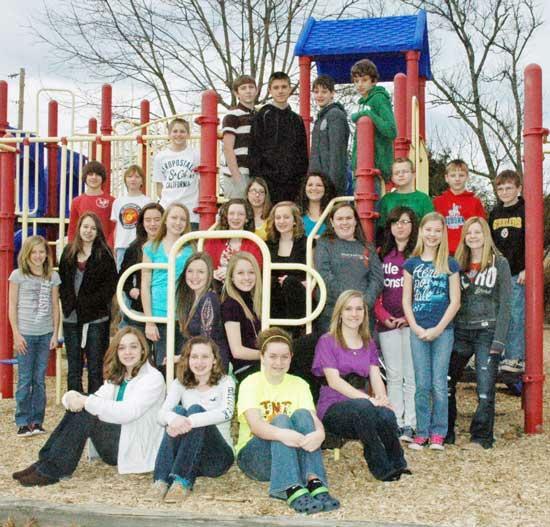 Beta Club has really grown over the years. To qualify for membership in the Jr. Beta Club, a student must maintain a 91 average in all academic subjects and be of high character. We currently have 27 members, and of those 27, 25 will participate in the campaign skit to get Marshall elected as National Jr. Beta Reporter. We have been busy fundraising so that all the Beta members will be able to attend the National Convention. We have sold candles, pizzas, and recently held a very successful horse show. We are very fortunate to have great community support in all our fundraising endeavors, and for that we are truly grateful. No article about Auburn School would be complete without mentioning our great year in athletics. For the first time in our school’s history, we won the Girls’ Basketball Championship, the Boys’ Basketball Championship, and the Spirit Award for our cheer squad. We had great fan support from our school, and we appreciate all our parents and other family members for their support. We also want to thank the young men and women who practiced and worked so diligently to give us a wonderful and exciting year and our coaches for their hours of work and encouragement given to these athletes. One last thing that is very important at Auburn School is giving back to our community and helping others. Our students are involved in several Service Learning Projects throughout the year. This year, our students have been involved in the following projects: Work Day (Playground and Gym clean up), Pennies for Patients (Leukemia Society), Letters to Soldiers, Thanksgiving Food Baskets, Toys, Clothing, and Food baskets for families in need at Christmas, Caroling at the Woodbury Nursing Center, Hearts for Cystic Fibrosis, Jump Rope for Heart, Soles for Souls, St. Jude’s Math a Thon, American Cancer Society’s Relay for Life, Cards to the Nursing Home, and sending supplies to the Alabama Tornado Victims. As you can see, Auburn School students have been busy this year. The faculty provides a well-rounded education that focuses not only on academic excellence, but also on character and the importance of giving back to the community and helping those in need. Come visit us and see why we think Auburn School is a great place to educate children.